When it comes to cookware like skillets, you need a pan that will stand up to the daily wear and tear of the kitchen. If you're looking for durability and functionality, the expertly crafted 10 inch Almond frying pan is a must-have for all kitchens and cooking levels. Designed with a thick 3.0 mm gauge construction, our pan provides superior, even heat distribution and durability. With slightly sloped sides and flared edges, this is the perfect pan for cooking omelettes and eggs or sauteing other foods. This pan can be used with gas, electric and induction cooktops. It's also oven safe up to 450 degrees F.
Is there anything worse than food sticking to your frying pan when you're cooking? Even when you grease or oil the cooking surface, many pans just don't stand up to the test. 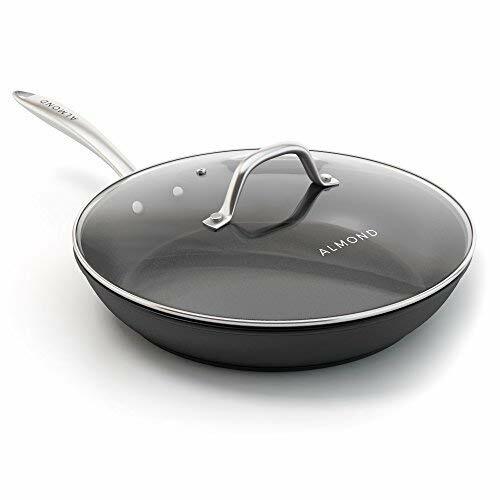 The Almond frying pan boasts a 3 layer coating that adds durability and allows food to release easily from the pan without sticking. And by using a pain with a built-in nonstick surface, you'll be using less oil and making every dish healthier! The Almond frying pan handle is designed with both comfort and safety in mind. Other skillet handles get hot while cooking, leading to an increased risk of burns. Our ergonomically shaped stainless steel handle is riveted to the pan to reduce heat transfer and provide extra strength. To make the cooking process easier, we include a matching glass lid with every Almond skillet order. The tempered glass lid traps heat, allowing you to cook your food faster and keep it warm until you're ready to plate. You'll also easily be able to monitor your meal throughout the cooking process. Other skillets force you to hand wash after each use, adding just another chore to your already busy plate. Almond pans are created with no toxic chemicals and are safe for the dishwasher.